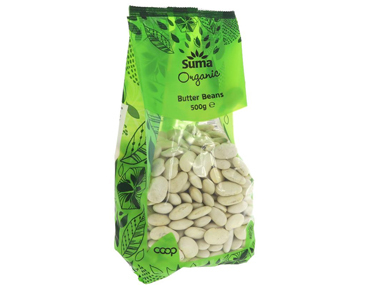 Order Suma Butter Beans - Organic from the Online Health Food Store UK. Buy Suma Organic Dried Butter Beans 500 grams and other quality Beans & Pulses safely online in the UK. Butter beans are delicious in soups, salads and with vegetables and stews. Where to buy Suma Butter Beans - Organic safely online? Shop at the Online Health Food Store if you are wondering where you can buy Suma Organic Dried Butter Beans 500 grams safely online in the United Kingdom.